New York . 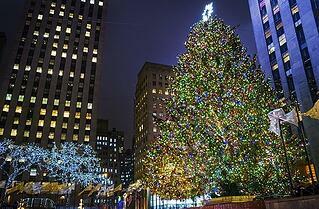 “I love to walk so I enjoy seeing the tree at Rockefeller Center,” says New Yorker Amy Goldsmith. Proof that, while a staple for visitors from all over the world, the tree is not just another tourist attraction. Philadelphia. Michael Brusca says “My favorite all around place to visit is the Reading Terminal Market. They have many awesome places inside, including Olde City Coffee which is the best coffee in the city (IMHO! )” He also highly recommends the apple dumpling from the Dutch Eating Place (“it only lasted for about 30 seconds”), the pies and doughnuts at Beiler’s, and The Dandelion - particularly if you like oysters! Sacramento. "It's not technically for a holiday, but the most exciting thing that happens here in December is the California International Marathon,” says Kristina Launey, who just ran a leg of the relay challenge. “Just in time for the holidays, the route goes through the city, ending right in front of the state capital and the big tree that goes up each year." Kristina also recommends checking out a true Christmas tradition: the Fabulous Forties. “They go all-out with decorations,” she says. “Walking through is absolutely one of my favorite things to do to celebrate the holiday season."